Looking for homily suggestions that faithfully represent the Scripture readings and offer hearers of the text practical applications for Christian life? 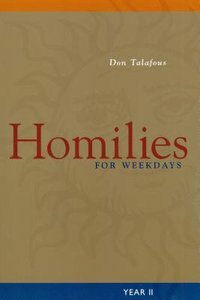 Homilies for Weekdays, the first of two volumes by Father Don Talafous, O.S.B., contains creative suggestions of what a homilist might say about the daily readings for the two-year Lectionary cycle. This extensive compilation for each day is a result of Father Talafous' many years of experience in preparing homilies. Written on both a popular and pastoral level, these homily ideas may also serve as daily reflections or meditations on the Scriptural texts for readers interested in nourishing their Christian lives with Scripture. About "Homilies For Weekdays Year 2"
Don Talafous, OSB, PhD, serves as alumni chaplain for Saint John's University in Collegeville, Minnesota. He is author of Homilies for Weekdays: Year I and Homilies for Weekdays: Year II.